An optical image is the reproduction of an object through a lens which results through the reflection, refraction or diffraction of light rays. A lens is an object, of transparent nature, that bends the rays of light. A lens can be of two types, concave or convex. The lens in turn create images. There are two types of images, created by lens, virtual and real. While similar in some respects, virtual and real images seem to be polar opposites. They are created when rays of light behave in an opposite manner, by lenses with opposite characteristics. Keywords: image, lens, real, virtual, conclave, convex. A real image is defined as one that is formed when rays of light are directed in a fixed point. A real image can be projected or seen on a screen. The best example of a real image is the one formed on a cinema screen. Real images are created when rays of light are converged by a convex lens also known as converging lens. The image is formed on the right-hand side of the lens. A convex lens, also known as a positive lens, is described as having thin edges and a thick middle surface. When rays of light pass through this lens the refracted rays of light, converge at one single point which is called a principal or focal point. A real image is always inverted. A virtual image is defined as the opposite of a real image, therefore an image that cannot be obtained on a screen is referred to as a virtual image. 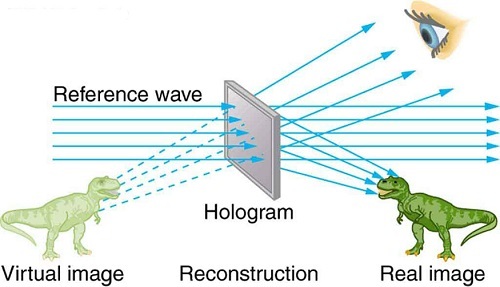 The explanation for this is the fact that the rays of light that form a virtual image never converge therefore a virtual image can never be projected onto a screen. The best example of a virtual image is your reflection in the mirror. A virtual image is created when rays of light diverge from a concave lens. A virtual image is formed on the left-hand side of the lens. A virtual image is always upright. In the world of optics real and virtual images are often described as opposites. Real images are produced by intersecting rays while virtual images are produced by diverging rays. Real images can be projected on a screen while virtual ones cannot. Real images are formed by two opposite lens, concave and convex. Virtual images are always upright while real images are always inverted. Real images can be projected or seen on a screen Virtual images cannot be seen or projected on a screen. Virtual and real images are the two types of images that can be created by light through the reflection, refraction or diffraction of rays. In optic physics the two ore often labelled as opposites in their characteristics. The main difference between the two images is that a real image can be displayed or projected onto a screen while a virtual image cannot. The best example for this is a cinema screen image versus your reflection in the mirror. The two types of images are created by two different types of lens. Real images are produced by a convex lens and virtual images by a concave lens. When a real image is created the rays of light are converged into one focal point while for a virtual image the rays of light are diverged. Maria Claudia Maier. "Difference between Real Image and Virtual Image." DifferenceBetween.net. October 2, 2017 < http://www.differencebetween.net/technology/difference-between-real-image-and-virtual-image/ >. Knight, Randall D. "Five easy lessons: Strategies for successful physics teaching." (2004): 414-414.